You are here: Home / All Posts / And The Paint Flies! Brain Olsen is an interesting blend of Artist, Performer and Energizer Bunny. 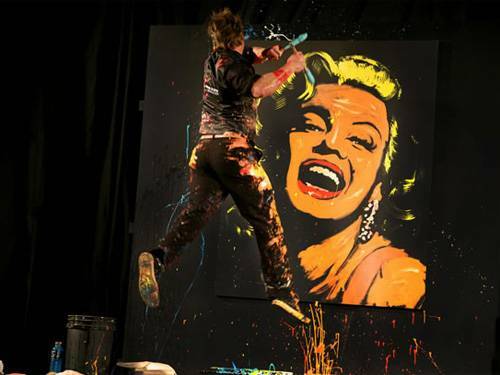 He creates large scale portraits of famous rockstars and pop icons live on stage before an audience. 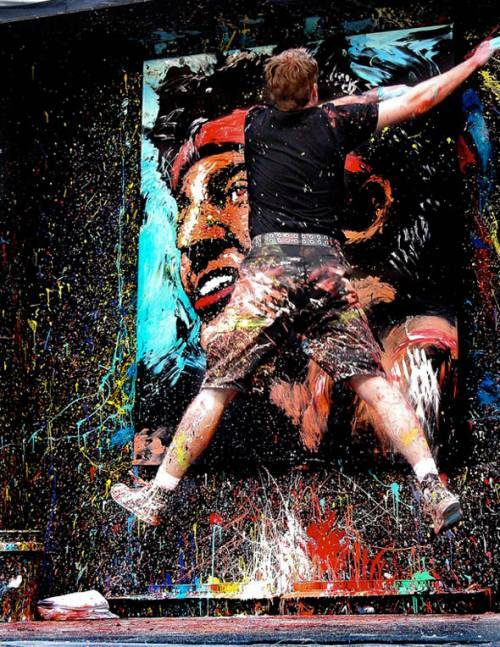 Armed with 3 paint brushes in each hand and the music blasting, he attacks the canvas with an almost reckless abandon. He throws paint everywhere. He uses his hands. He jumps and dances and runs around to the tempo of the music. In short, he’s taken painting and turned it into performance art. No, he’s turned it into a spectator sport. But Brain learned all he knows, trade secrets some would say, from another performance painter. The Artist who helped create and define this niche of performance art, Denny Dent. This retrospective does a decent job of explaining Denny and his impact on painting as performance. I wrote this article because I like the blending of the artistic genres. I like the idea that art is not bound by a single, static medium. It is meant to be alive, to flow, evolve and grow. For pushing the stiff and narrow boundaries of art standards, both Brain Olsen and Denny Dent have my admiration. For more on Denny Dent visit his website: www.dennydent.com. « Ashes To Ashes To Portrait! I can’t seem to properly browse this page from my smartphone!! !